“Snowpiercer” is now playing at Star Cinemas. R, 2:09, four stars out of four. The guys at madfilm.org have planned a “Madison Meetup” to go see “Snowpiercer” at 7:30 p.m. Tuesday. 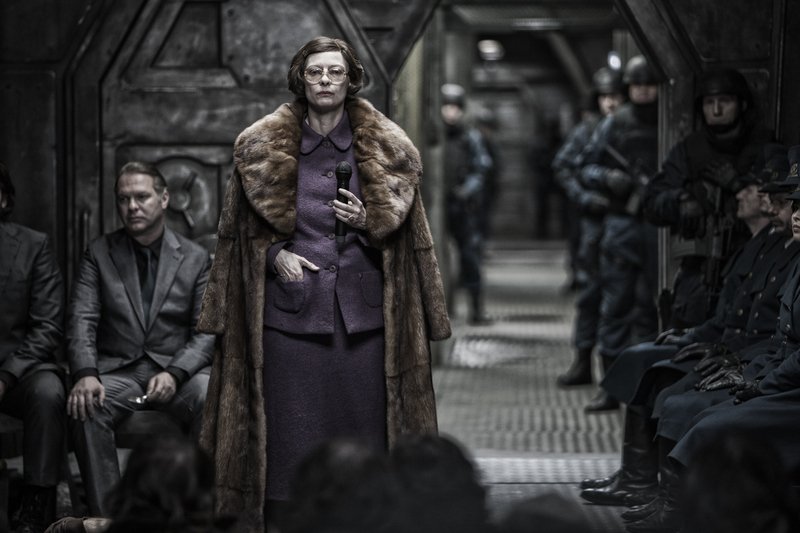 Within the space of a 60-foot-by-9-foot train car, “Snowpiercer” packs in more action, inventiveness, energy and ideas than most summer blockbusters that have whole galaxies at their disposal. The long-awaited English-language debut from South Korean writer-director Bong Joon-Ho (“The Host”) is a sleek sci-fi/action epic that has a lot on its mind and an exquisite sense of momentum and pacing. This thing MOVES. The “thing” in question is the Snowpiercer, a supertrain built by an eccentric billionaire named Wilford that circumnavigates the globe exactly once per year. On July 1, 2014, when an attempt to arrest global warming backfires and plunges the world into a deadly freeze, the Snowpiercer becomes a “rattling ark” for the last 1,000 people on earth, hurtling round and round the world for the next 17 years. It’s been a rough ride, especially for those who could only afford coach. 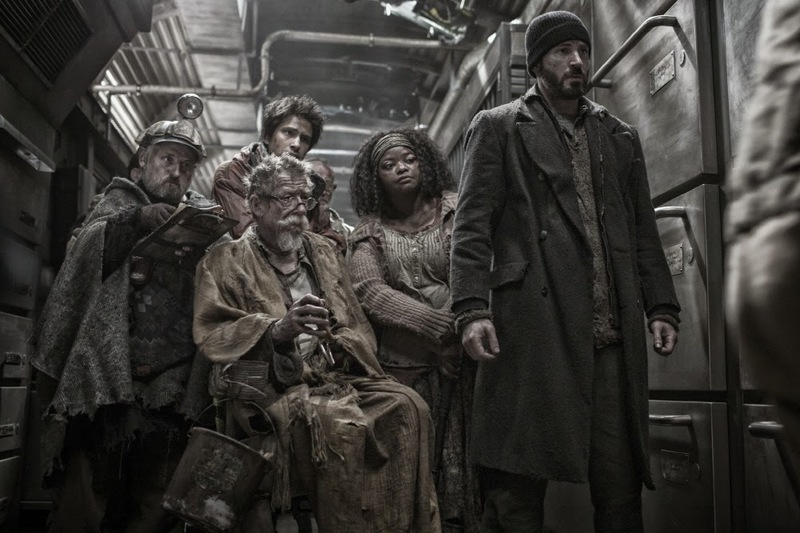 We start “Snowpiercer” at the back of the train, where the poorest denizens are crammed together in grubby cots like refugees, subsisting on gelatinous protein bars, prodded and threatened (and even tortured) by gun-wielding guards. Every once in a while, the officious Minister Mason (an unrecognizable and riotously funny Tilda Swinton, looking like a cross between Margaret Thatcher and a cane toad) comes back to sternly lecture the rabble not to want anything more than the barely subsistent existence they’re given. “Know. Your. Place,” she shouts. A few, though, have had enough of their place. Curtis (Chris Evans) plans to lead a revolt, storming forward through the train to the front, where the never-seen Wilford is supposedly running the engine. His allies include Edgar (Jamie Bell), who worships Curtis as a hero, Tanya (Octavia Spencer), a mother searching for her kidnapped son, and, later, Minsoo (Kang-ho Song), a security expert with a drug habit that Curtis can exploit to get him to open the gates separating the cars. Curtis’ spiritual guide is Gilliam (John Hurt), an old man who has sacrificed three of his four limbs for his people. For the first half of the film, the rebels plunge forward, seizing car after car, a bloody and protracted struggle. While so many action directors choose spectacle over sense, it’s a pleasure to watch Bong execute one crisply-staged action sequence after another, always keeping clear the spatial geometry within those narrow cars. A gory mob battle between club-wielding rebels and axe-wielding guards turns one car into a charnel house, while later, a sniper duel carried out between train cars rounding a curve is a masterpiece of cool precision. Up until the halfway point, “Snowpiercer” feels like a wildly clever but still relatively straightforward action movie, with a clear narrative goal in sight. But then things start to change. Bong starts to introduce oddly lyrical moments amid the mayhem, extreme close-ups of people killing or being killed, out-of-focus sparks of flame twinkling almost beautifully behind the blood spatters. The effect is disorienting. And finally, the narrative starts to shift and buckle under our feet, as the pilgrims trudge through this surreal wonderland, learning just how insane the Snowpiercer ecosystem is, and how that madness has affected everyone on the train, rich and poor. (If you only think of Evans mainly as the square-jawed Captain America, you’ll be knocked flat by his deeply troubled, damaged performance here.) We know we can’t trust the villains on the train, but our heroes turn out to be not so honorable either. As Curtis gets closer to the train’s engine, we realize that the real engine driving “Snowpiercer” isn’t action but ideas, big ideas not just about economic inequality (although that’s a big driver here) but the very nature of a functioning civilization itself. Bong makes us consider whether it’s human nature to want to live in an unequal society, that we need to feel envious of the guy in the train car in front of us, fearful of the guy in the train car behind us. But unlike something like “Elysium,” which would quickly jettison its ideas whenever they became inconvenient to the plot, “Snowpiercer” seamlessly blends all its elements together into a masterpiece of thought-provoking science fiction. And one that’s also a hell of a ride.